The Shaftesbury Theatre was designed for the brothers Walter and Frederick Melville by Bertie Crewe and originally opened as the New Princes Theatre in December 1911. It was designed by the famous theatre Architect Bertie Crewe. It was the last theatre to be opened on Shaftesbury Avenue situated in a very convenient position in Shaftesbury Avenue, near the New Oxford Street end. 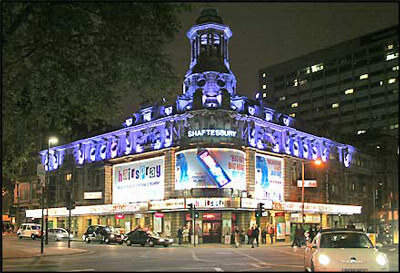 It was renamed the Shaftesbury Theatre during the run of “Wonderful Town” in 1955. In 1973 during the run of “Hair” part of the ceiling collapsed overnight and forced closure of the theatre which looked as though it was going to be demolished. However, it was saved by Save London's Theatres Campaign who fought long and hard for its survival and had it added to the Statutory List of Buildings of Special Architectural or Historic Interest by the Department of Environment. The theatre was Grade II listed by English Heritage in March 1974. The theatre reopened with West Side Story a year later and musical productions in the 1980s included They're Playing Our Song and Follies. The 90s included Kiss of the Spider Woman and Rent. During the redevelopment of the Royal Opera House in nearby Covent Garden in the late 1990s, the Shaftesbury was used as an alternative venue for performances including Benjamin Britten's Paul Bunyan. A series of musicals followed. The Theatre of Comedy Company, founded by Ray Cooney, purchased the Shaftesbury in 1984 and still own it today. In 2006 the 1,400 seater Shaftesbury was refurbished, with the auditorium and front of house redecorated and stalls and dress circle reseated. The Shaftesbury Theatre is currently hosting the European premiere of the Tony Award-winning Broadway hit Hairspray which opened there in October 2007. This theatre participates in the Theatreland Parking Scheme - find out more about the great discounts offered by clicking on the link. Spaces for 4 wheelchairs in Boxes A and B which are down 3 steps off corridor to the left of box office. You will need help negotiating the steps. Transfer seating available to row A4 - 10 in the Royal Circle - entrance is level from the foyer.